Samsung Unpacked 2014 opened with Marco Parisi, an Italian musician, harmonizing with the Grand Art Ensemble orchestra by using his app on the Galaxy Note 3. That music app is now available for download and it is called, Soundcamp. Samsung Tomorrow talked to the people behind the app: a product planner, a UI developer, an auditory UX designer, and a principle engineer of the Soundcamp app. We wanted to hear what they thought about the app as well as some tips on how to better use it. 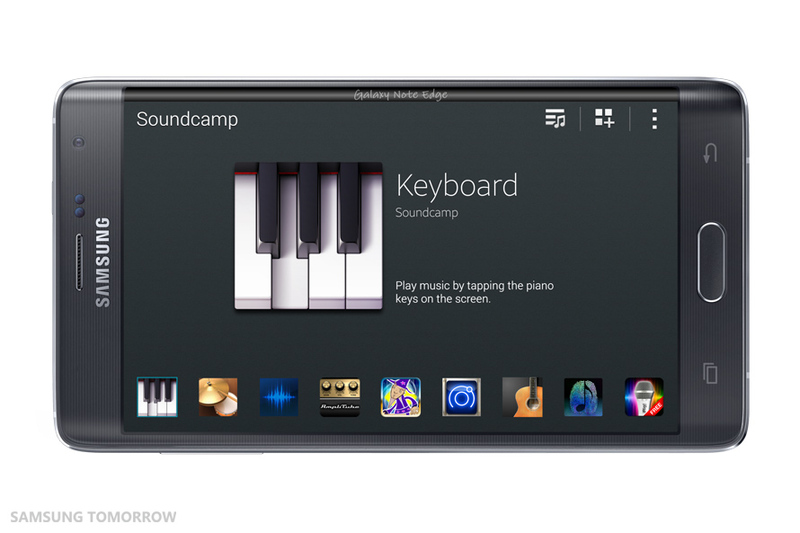 So, what exactly is Samsung Soundcamp? 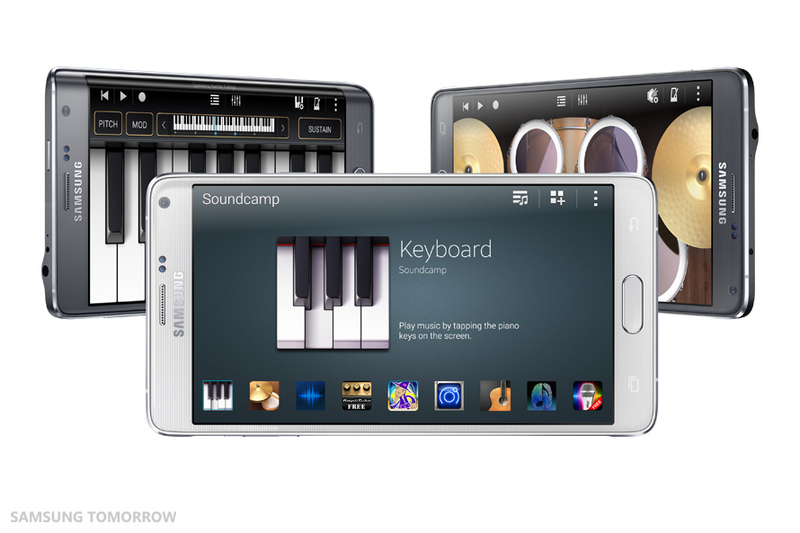 Samsung Soundcamp is a mobile DAW (Digital Audio Workstation) application. Basically, it is an open platform consisting of two internal virtual instruments and audio input, and various third party virtual plugin instruments and effects for Android. Anyone interested in music can play, compose, and even share their songs anytime and anywhere with an internet connection on the platform. From amateurs to professional musicians, anyone can use this app with ease. Where did the idea of creating Soundcamp come from? As singing audition shows gained attention on TV and even music composition competitions became common, Samsung recognized a changing trend in music: from listening to participation. Samsung also knew that even novice musicians want to play musical instruments at a certain level of proficiency. This naturally led Principal Engineer JeongWook Seo and his team members to think of creating a professional music app, which allows users using Samsung smartphones to both compose music easily and share the music with their family and friends. In fact, according to Sungmin Kim, auditory UX designer at Samsung, the UX designers were preparing something similar already and were building on that concept. Once that concept became a real project, a task force team, consisting of former music producers from famous Korean entertainment companies, UI designers, engineers, and product planners, was formed. Through this unique app, Samsung wanted to bring a real music studio experience to a virtual mobile device, including musical instruments and various sound effects. In addition, Samsung also knew it was important to make this app look snazzy. The desired reaction was something along the lines of ‘Wow! Someone who knows music made this app!’ as soon as they activate the app. What were the difficulties during the development process? Since Soundcamp was designed for everyone, from amateurs to professionals, background knowledge in music was indispensable in the development process. Although engineers enjoyed listening to music, they lacked so much musical knowledge compared to those who had studied music professionally. Hence, in the beginning of the development process, intermissions in between discussions often occurred, concerning music terms and concepts. However, according to JeongWook Seo, principal engineer at Samsung, said his engineers learned a lot about music through university-level music textbooks that they studied. Thanks to their hard effort, they were able to talk at the same level with the professionals and give insights that were beneficial to development. Furthermore, Samsung engineers faced impediments in developing a professional music app that allows real-time audio and MIDI processing at the professional level. In fact, it was hard for even other developers to create music using real-time audio and MIDI on Android devices with the current technology and accessible platform that facilitates various apps and services to function on all manner of hardware. To overcome this situation, Samsung engineers suggested a new way to control the hardware directly, making a detour around the Android security structure. They added various features that are needed when developing a professional music app, ultimately creating a system called S Professional Audio last year. This system allows real-time audio and MIDI processing at the professional level, and Soundcamp was created based on this system. So, what is so unique about this app? One of the perks of this music app is its audio mixer. Just like a real mixer used in recording studios, users can combine, route, and change the level and dynamics of audio signals using this mixer. In fact, to fit it into the screen of Samsung smartphones, the mixer functions were divided into three layers: mixer, effectors insertion, and Equalizer. This allows users to easily edit their recordings on one screen, making it even easier to use. To help continue the innovation process, developers can easily upload their apps on Soundcamp. In fact, Samsung’s Professional Audio SDK 2.0 was released at SDC 2014 along with Soundcamp to encourage developers to create virtual instrument apps easily with Android. Once developers develop their apps using the SDK and register them on Galaxy Apps, they will be automatically uploaded on the open platform, i.e. Soundcamp, as third party apps. Due to this easy process, 20 developers and companies have easily shared their apps on Soundcamp and more apps are in process of being launched. How did third parties participate in the creation of Soundcamp? In the case of MorphWiz, an expressive musical instrument created by Jordan Rudess, the legendary keyboardist of Dream Theater is a good example. Jordan’s company Wizdom Music had been looking at the Android system for a long time and faced problems like audio latency, which is a lag between input (like a tap on a virtual keyboard) and sound output (throughout the speaker) . When Taemin Cho, product planner at Samsung, contacted Jordan Rudess directly, he was eager to participate in creating Soundcamp, and gladly offered his premier app, MorphWiz, for the new app. Along with MorphWiz, Samsung got in touch with the developers of Amplitube, EZ Voice, Heat Synthesizer, Guitarism, and Thumbjam, who also decided to contribute their apps to Soundcamp without hesitation. How can users use this app effectively? Soundcamp has a multitrack recording function, which allows users to record their songs in MIDI or stereo audio in up to 8 tracks. This means users can add 5 more instruments, like MorphWiz, even after recording their tunes on the drums, classic guitar, and piano, creating a full-bodied sound. Users can also edit their recordings easily using the MIDI editing function. Moreover, thanks to the simple layout, users can get access to third party apps easily from the home screen, downloading them directly from Samsung Apps or Google Play. For instance, if you want to use ThumbJam, all you need to do is find the app on the store and touch the download sign on the screen. It’s as simple as that. Anywhere and anytime there is an internet connection, users can easily create a fun and exciting atmosphere using Soundcamp. In fact, at his 5-year-old son’s birthday party, product planner Taemin Cho used the tune that he recorded on Soundcamp for accompaniment, which was composed by using acoustic drums, Morphwiz, ThumbJam, and a lot more, while he played his guitar and his son sang his favorite cartoon theme song. His family and relatives enjoyed the performance and even requested an encore. What do you wish to pursue through music in the end? Principal Engineer Jeongwook Seo believes that music is the strongest tool that stimulates nostalgia among the five senses.. As the generation is changing from simply listening to music to directly engaging in music, virtual musical instruments and sharing have become crucial factors. Thus, he hopes that the change in trends would be connected through Soundcamp. Soundcamp will be continuously improved in terms of overall performance, functions, and usability, with more accessible internal and third party apps coming along. Samsung aims to make Soundcamp the platform for music composition/performance apps and hopes to create something like a multiplex theater where users interact with various music composers and musicians through the Soundcamp-based ecosystem. It’s never been easier to compose and record your own music, so why not share your fantastic music on Soundcamp and give it a shot! 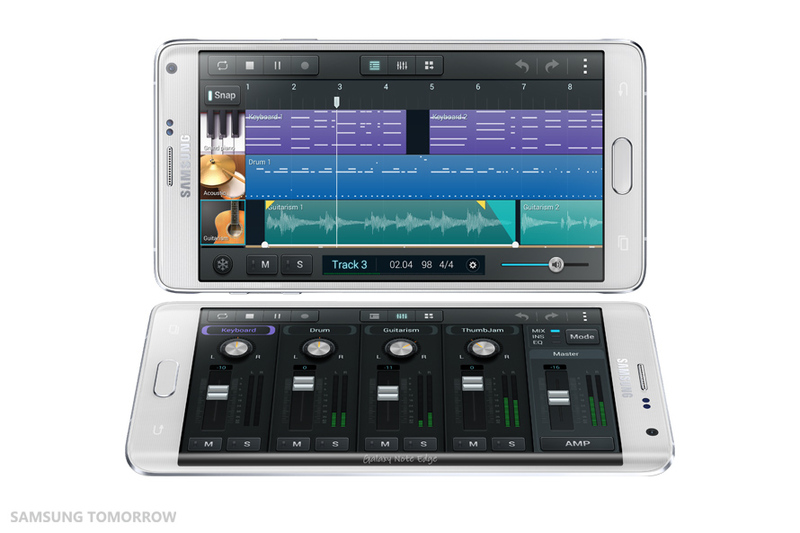 * Samsung Soundcamp is available on Galaxy note 4 and Note Edge for now, and will be available on Galaxy Note 3 and Galaxy S5 by the end of this year. ** All functionality features, specifications, and other product information provided in this document including, but not limited to, the benefits, design, pricing, components, performance, availability, and capabilities of the product are subject to change without notice or obligation.